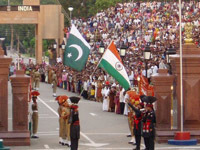 India has offered to resume official talks with Pakistan that were suspended after the bomb attacks on Mumbai (Bombay) in 2008. An official in Delhi told reporters that India had proposed talks involving the two country's foreign secretaries. Pakistani officials are reported to be seeking clarification on the content. However, foreign minister Shah Mehmood Qureshi said Pakistan would welcome the move if it led to the resumption of a "comprehensive dialogue". India blamed Pakistan-based militants for the attack on Mumbai in November 2008 in which more than 170 people died. Indian media, quoting government officials, reported on Thursday that the offer to resume talks included all relevant issues, including terrorism. No suggested date has been made public. There is still much suspicion between the two sides, but there seems to be a willingness on the part of both governments to move forward. Any thaw between the two countries would be welcomed abroad - particularly by the US, Britain and other countries who have troops in Afghanistan fighting against the Taliban. Better relations between Delhi and Islamabad are seen as a vital element in any broader regional settlement.